When we took possession of Eolian, the PVC and rubber head hoses had been permeated by the ‘contents’ of those hoses, making a bad smell everywhere down below. We replaced all of those hoses early on with good hose. In 2006, about 7 years later, those hoses had again been penetrated. My research (oh sure, NOW do the research…) showed that even the highest grade hose (which costs in excess of $10/ft) permeates in 10 years. The cheaper grades are supposed to last only 5 years. I guess that means that we did better than most. 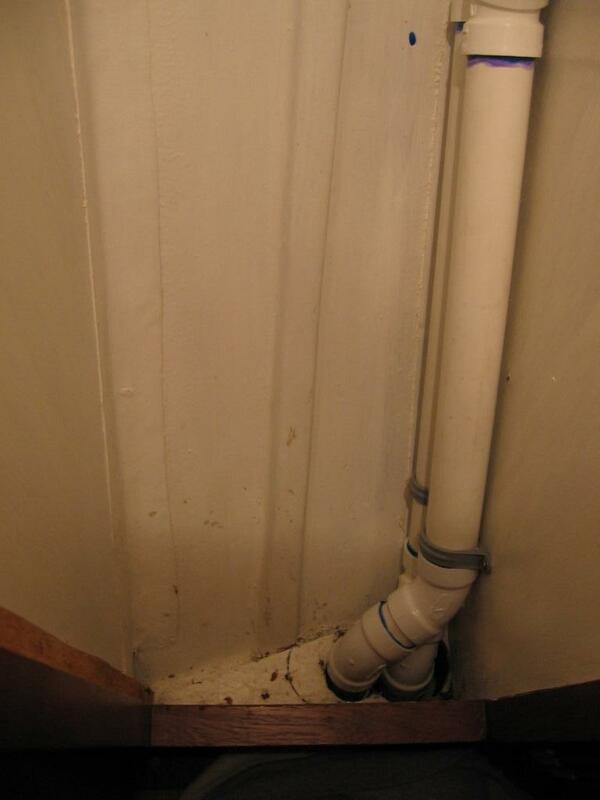 The same research showed that solid PVC pipe (like that used in houses) will NEVER permeate. So, OK – out with the hose, and in with solid PVC pipe. 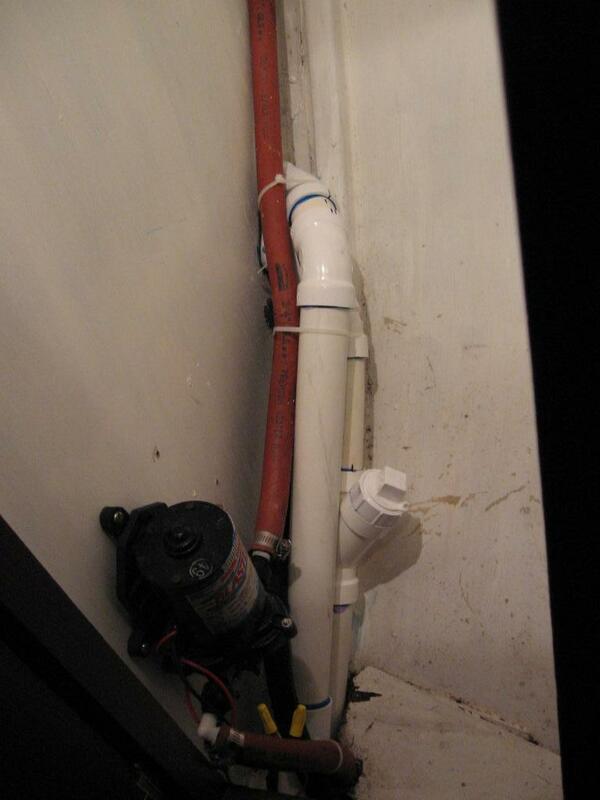 First problem: most plumbing supply houses stock only ABS for sanitary fittings (long sweep elbows, sanitary tees, etc… Things can get hung up in regular sharp-cornered elbows, and sewer snakes can’t be made to go around sharp corners.) 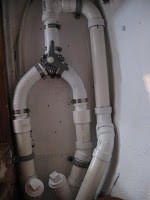 But we have found a couple of stores close by that stock PVC fittings, and in ALL the weird angles we will need to use to run pipe in a boat. Also, some short lengths of hose are still needed to make connections at the ends of the pipe runs – stuff moves on a boat, and flexible connections are required to prevent breaking the pipe, so special hose-to-pipe adapters were needed. Found those too, in a store that specializes in marine heads. 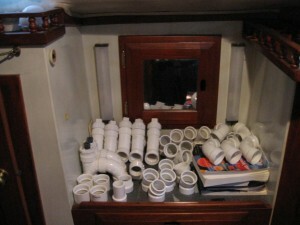 I have found that it takes way more fittings to do this plumbing on a boat than it does to plumb a house. In a house, virtually everything can be addressed with 90 degree elbows – 45s are rarely used. On a boat it is the 90 which is rare. Also, there is the logistics of assembly. Put things together in the wrong order, and you literally “can’t get there from here”. Finally, the small spaces get you. For example, the inside dimension of the forward head sink vanity, thru which two runs needed to pass, is 27″. Outside dimension, and leaving enough to cement on a fitting on the end, is 31″. 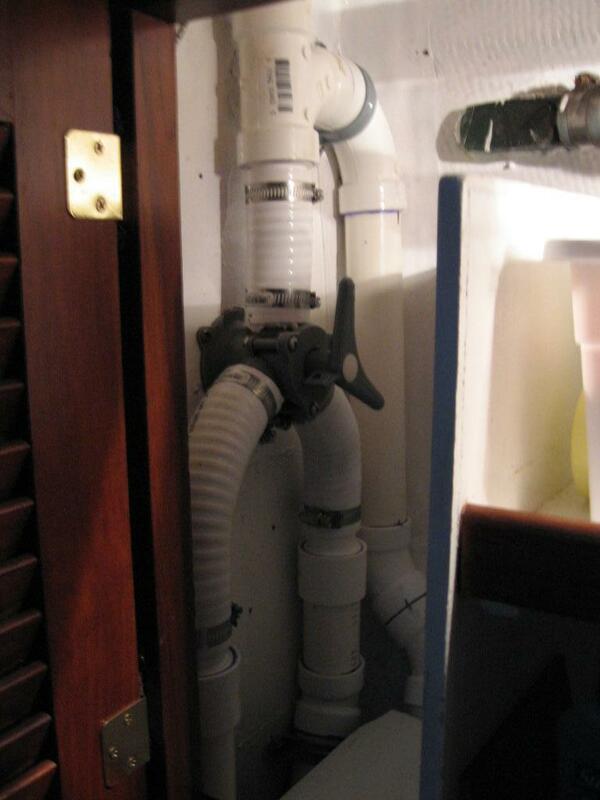 But because of the cramped spaces, there is no way to get a 31″ piece of pipe in there. So, you cut it in half, and join it with a coupling inside the cabinet. Standing on your head. Working at arm’s length in a small space. Breathing in the PVC cement fumes. Also, because I can, I included cleanouts (wyes with screw-out plugs) where it made sense (at least one on each pipe run). These allow access with a sewer snake, but also provide a port which can be used to add hydrochloric acid to dissolve the carbonates which form as a reaction product between urine and seawater. I decided that all these cleanouts need to be above the waterline, so the plugs can be safely removed even if the seacocks are not closed. Finally, I used PVC fittings to make improved versions of the vented loops. The original bronze ones were only 1″ internal diameter, and were mostly clogged with carbonates anyway. Mine are 1.5″ diameter all the way thru, and in addition provide a disengaging zone below the vent line so that it is less likely that sewage will enter that vent line.